iCLASS was specifically designed to make access control more powerful, more versatile, and more secure. iCLASS 13.56 MHz read/write contactless smart card technology provides versatile interoperability in applications such as access control, network log-on security, cashless vending, time and attendance, event management and biometric identification. iCLASS technology ensures high security with mutual authentication between card and reader, encrypted data transfer, and 64-bit diversified keys for read/write capabilities. Securely separated files enable multiple applications and support future growth. 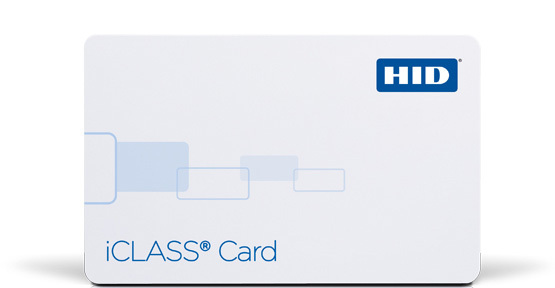 The iCLASS card meets ISO standard for card size and thickness for use with direct image and thermal transfer printers. It features a graphics quality surface optimized for Photo ID printing, and is available in standard PVC construction, or a composite polyester/PVC construction for more demanding high wear and tear environments. The card can be produced with visual security and anti-counterfeiting features such as holograms, ultra-violet fluorescent inks, micro-printing, or a custom logo to quickly and easily identify genuine cards. 13.56 MHz read/write contactless smart card technology provides high-speed, reliable communications with high data integrity. iCLASS technology ensures high security with mutual authentication between card and reader, encrypted data transfer, 64-bit diversified keys for read/write capability. Meets ISO standards for thickness for use with direct image and thermal transfer printers. Offers the ability to add a magnetic stripe, barcode, anti-counterfeiting features, custom artwork, or photo ID. Available in 2k bit (256 byte), 16k bit (2K Byte) or 32k bit (4K Byte) memory configurations. Supports all existing HID card formats, including Corporate 1000. Supports field programming of any existing HID format into the secure HID access control application area on the card. Thin, flexible polyvinyl chloride (PVC) laminate.